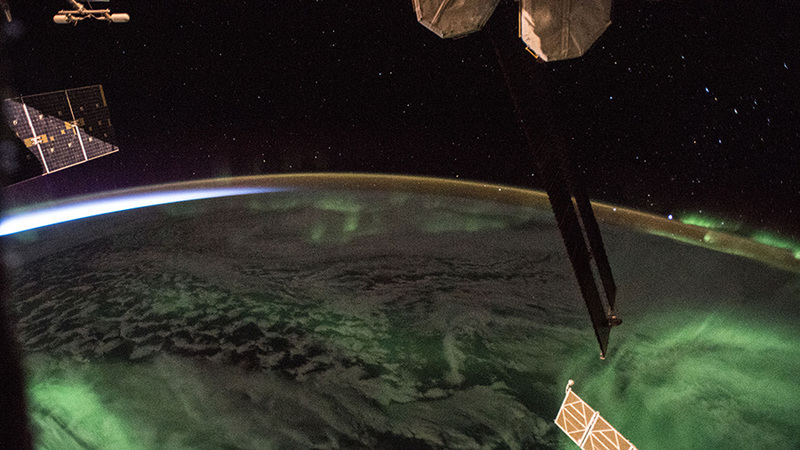 Daybreak begins to interrupt this aurora as the International Space Station flies an orbital day pass. The Expedition 55 crew explored a wide variety of life science today studying how different biological systems are affected by long-term exposure to microgravity. The multi-faceted space residents observed human genetic and tissue samples, rodents and fruit flies aboard the orbital laboratory today. Flight Engineer Ricky Arnold started his morning gearing up the student-designed Genes in Space-5 experiment. He processed hardware and genetic samples to help scientists understand the relationship between DNA alterations and weakened immune systems possibly caused by living in space. Arnold later joined fellow NASA astronaut Drew Feustel for ultrasound eye exams with remote assistance from doctors on the ground. Feustel wrapped up his workday checking on fruit flies housed in the Multi-Use Variable-G Platform that enables research into smaller and microscopic organisms. Norishige Kanai, from the Japan Aerospace Exploration Agency, tended to mice recently launched to space aboard the SpaceX Dragon cargo craft. The rodents are part of the Mouse Stress Defense experiment that tests strategies to counteract microgravity stresses and cell signaling that lead to bone and muscle loss. Doctors are learning how medicine works in space and what it does inside astronaut’s bodies. NASA Flight Engineer Scott Tingle looked at a particular type of medicine today and how it interacts with human tissue cultures. Results could improve therapies in space and lead to better, cheaper drugs on Earth.